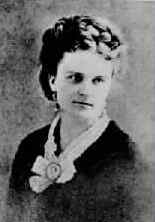 Kate Chopin was born Catherine O'Flaherty on July 12, 1850, in St. Louis, Missouri. She was the daughter of an immigrant Irishman, Thomas O'Flaherty, and a French Creole mother, Eliza Faris. Kate was their youngest child. In 1855 Thomas O'Flaherty died suddenly from a work-related railroad accident. Kate lacked male role models in her life after her father died. She was raised by three generations of women, including her maternal great-grandmother, Madame Victoria Verdon Charleville, who instructed Kate in music lessons, French lessons (she only spoke to Kate in French), and storytelling. Additionally, Kate attended the prestigious Sacred Heart Academy, which promoted intelligence and independent thinking: this helped Kate begin her lifelong love of reading and writing. When Kate she was eleven, Madame Charleville died, and Kate's half-brother George was killed while fighting in the Civil War for the Confederate side. Kate married Oscar Chopin, the son of a wealthy cotton-growing family in Louisiana, in June, 1870. Their union produced six children (five boys and two girls). Oscar was French Catholic, as was Kate. In 1882, Oscar Chopin died of malaria (swamp fever). Kate managed her husband's business for approximately a year and then returned to live near her mother in St. Louis. A year after her return, her mother passed away. To support herself and her family, Kate began to write. She was immediately successful and wrote short stories about people she had known in Louisiana. Her first novel, At Fault, was published in 1890 when Kate was forty and was followed by two collections of short stories, Bayou Folk (1894) and A Night in Acadie (1897). When The Awakening was published in 1899, the story created a scandal because of its portrayal of a strong, unconventional woman involved in an adulterous affair. It was inspired by a true story of a New Orleans woman who was infamous in the French Quarter. By 1899, Kate was a well-known woman writer, having published over one hundred stories, essays, and sketches in literary magazines. Chopin died of a brain hemorrhage after a strenuous day at the St. Louis World's Fair. She was remembered only as one of the southern local colorists of the 1890's until The Awakening was rediscovered in the 1970's. A third collection of stories A Vocation and a Voice was published posthumously in 1991. A book of short stories that includes "The Awakening," the story of a woman's awakening through an affair.